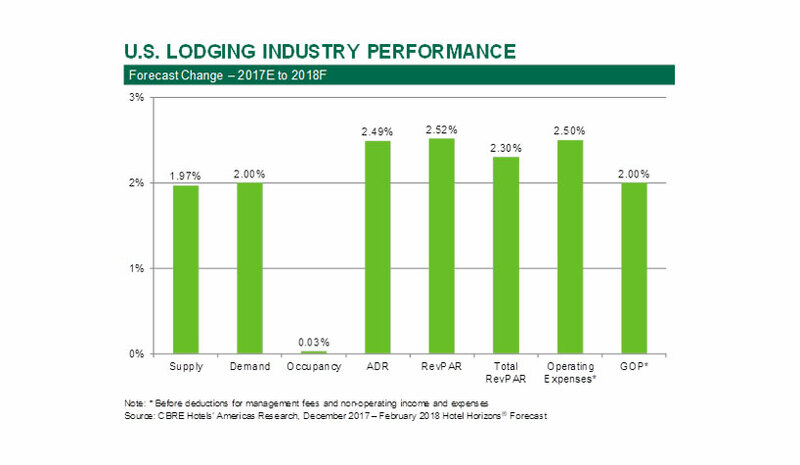 U.S. lodging industry performance appears to be sustainable. ATLANTA—The U.S. lodging industry is forecast to see continued levels of record occupancy through 2019. If achieved, this will mark a 10-year period of uninterrupted growth in this key industry metric, according to a study released by CBRE Hotels’ Americas Research. The company’s December 2017 edition of “Hotel Horizons” predicts the annual average occupancy rate for U.S. hotels to hit 65.9% in 2017 and that it will remain at this level through the end of the decade. Despite the record occupancy levels, ADR growth continues to challenge hoteliers. Factors such as increased supply growth, low inflation, the sharing economy, revenue management beyond RevPAR and book-direct, and best-price guarantees all put downward pressure on the ability of operators to raise rates. For 2017, CBRE is forecasting an annual ADR increase of 2.2%, followed by 2.5% in 2018. Both measures are below the long-run average annual ADR growth rate of 3.1%. As hotels finalize their 2018 budgets, it is important for owners and operators to understand their local market conditions, CBRE noted. Previous research conducted by CBRE has found that 75-80% of a hotel’s performance is dictated by local economic and market factors. Among the 31 markets forecast to achieve RevPAR changes below the projected 2.1% inflation rate in 2018, the average increase in lodging supply is 3.8%. Conversely, the remaining 29 markets forecast to see RevPAR growth greater than 2.1% will see their competition increase by just 2.7%.